The municipality of Valladolid (315,522 inhabitants in 2010; 19,791 ha; municipal website) is the capital of Valladolid Province and the unofficial capital of Castile and León, and the most populous town in Castile and León. Valladolid was probably named for the Celto-Roman toponym valle tolitum, "the water's valley". The town was officially founded in 1074 by Count Pedro Ansúrez on behalf of King Alfonso VI; the Count built the town, an hospital and a bridge over river Pisuerga. His descendants, the Counts of Urgel, would rule the town until 1208. Berenguela was recognized Queen of Castile in 1217 on the Valladolid market square; in 1246, the marriage of Alfonso X with Violante of Aragón was celebrated in the town. The Parliament met in 1295, 1301 and 1307 on the banks of the Pisuerga. In 1300, the Regent Queen María de Molina settled in the town and increased it. The town was ravaged in 1400 by the black plague. King Henry III allowed the widows from Valladolid to remarry after one year of mourning. On 2 January 1412, it was decided that Moors, Christians and Jews would live in separate boroughs. In 1469, the wedding of Ferdinand of Aragón, "the best young man in Spain", and of Isabel of Castile, "the blue-eyed princess", was celebrated in Valladolid at the Vivero Palace; the event has been nicknamed "The Wedding of Spain". Christopher Colombus died in 1506 in Valladolid. King Charles I entered solemnly Valladolid in 1518, taking the oath at the Parliament on 12 February; the king was not totally welcomed in the town, his opponents claiming that "he was not born in Spain, did not belong to the Castilian Royal house via a male lineage and should, therefore, not take the oath". The discontent spread to whole Castile and the uprising known as the Communeros War broke out in 1520, suppressed in 1522. King Philip II was born in 1527 in Valladolid. The Royal Court moved to Madrid in 1559. Following the 1561 blaze, the main square of the town was redesigned on a square design, the first of that kind in Spain and the model for the main square of several other Spanish towns. From 1601 to 1606, Valladolid was made again the capital of Spain by Philip III, which did not prevent the decline of the town. Valladolid reemerged in the 18th century with the development of cloth industry. The dynamic "mill bourgeoisie" emerged in the second half of the 19th century, when the economic development of the town was boosted by the building of the Castile Canal and of the railway. The Valladolid Bank was founded in 1856, followed by several credit companies. The flag of Valladolid (photo, photo) is crimson red with the municipal coat of arms in the middle. The arms of Valladolid (description) are "Gules five gyrons wavy or issuant from dexter, a bordure gules eight castles or. The shield placed over a cross pointy argent orled with laurel". The local tradition says that the flames on the shield recall the 1561 blaze. Others say that the arms were granted to the town in 1454 by King Henry IV. Yet another theory refers to an alleged banner of war of Castile ending with five points. The bordure with the eight castles was added in 1596 when Philip II granted the title of ciudad to Valladolid. A medieval seal is also surrounded by a bordure "decorated" with eight towers, symbolizing the town wall. The eight castles were subsequently identified with the eight fortified gates of the medieval wall. The shield is placed on the Laurel Cross of San Fernando, a controversial symbol because of its origin (Andoni Esparaza, La Cruz de Valladolid, Emblemata, 14, 489-497, 2008). As a reminder of the heroic gesture of Valladolid in the National Movement and as a tribute to its decisive contribution in the early moment of the Spain liberation war, the Laurel Cross of San Fernando is awarded to the town, which should add it to his shields as of today. 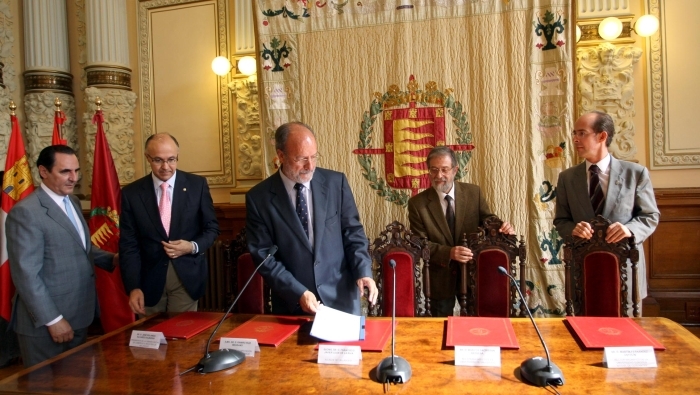 To decide how to add the Cross to the arms, the Navarre authorities asked advice from José María de Huarte y Jáuregui, Head of the Provincial Archives, and from José de Rújula y Ochotorena, Marquis of Ciadoncha and King of Arms of Navarre. The two advisors proposed that, according to the rules of the National and Military Order of San Fernando and of Spanish heraldry, the Cross would be placed behind the shield. Valladolid followed the same model. On 26 October 1981, the Parliament of Navarre decided to drop the Laurel Cross of San Fernando from the Navarre coat of arms. The public administrations, in the exercize of their competence, shall take the necessary means to remove the coat of arms, insignia, plaques and other objects or commemorative writings exalting, personally or collectively, the military uprising, the Civil War and the repression exerted by the Dictatorship. Among the necessary means can be included the cancellation of public subsidises and grants. However, the coat of arms of Valladolid - as well as the coat of arms of Valladolid Province - has not been amended yet.